There are six crucial steps that take place to get the best quality water to your home. 1. How is rain collected? The water that comes out of the taps at your home, school and work starts off as rain. This rainwater either flows into rivers and streams, is collected in reservoirs or filters through the earth to form ‘groundwater’. Water companies then pump this water to their water treatment works where it goes through various treatment processes before they send it to you. As water companies take water from various rivers and ground water sources, the quality of it can be different, so the treatment process it goes through is tailored to make sure they give you the best quality water possible. 2. How and why is water stored? So that companies have a store or reserve of water, so if it hasn’t rained for a while or they can’t pump as much water from the rivers or groundwater sources, companies have water available to put through the treatment process. Storing the water in reservoirs starts the natural clean-up process, as heavier particles settle to the bottom, meaning companies don’t have to take them out during the treatment process. Many of these reservoirs are used by local communities for sailing, fishing, nature walks and bird watching. 3. Why is the collected rain water screened? Once companies have collected the water, they put it through a screen to capture any branches or leaves. If left in the water they would almost certainly clog up the treatment process. 4. How are particles removed? At some treatment works, companies add a solution to the water to make the particles bigger and easier to remove. This is called flocculation. Rapid gravity filters which means the water is passed through a tank full of coarse sand. The sand traps particles as the water passes through. Slow sand filters whereby the water is slowly filtered through large beds of much finer sand. 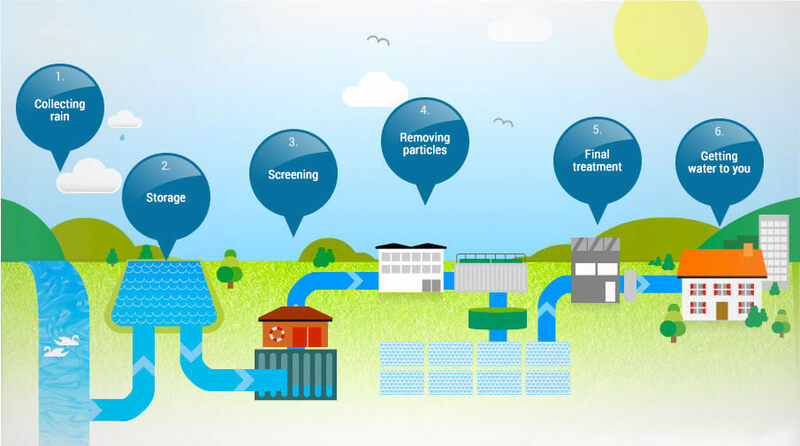 At some water treatment works companies also use additional methods, such as ozone, carbon and ion exchange, to remove microscopic and dissolved particles from the water. These methods create chemical reactions in the water and remove fine particles. 5. How do companies finally treat the water and ensure it is of the highest standards? Once the water has been treated, the last thing water companies do is add a very small amount (less than one milligram per litre) of chlorine to it. This kills any remaining organisms or bacteria and keeps the water safe, right up until it reaches your tap. Water companies test the water at every stage of the treatment process. They carry out thousands of tests a year on the water they produce, which teams of samplers and scientists analyse in laboratories. 6. How does water get to a customer’s property? Following final treatment, the water leaves the treatment works and is stored in covered reservoirs. It is then pumped to you through a network of pipes and pumping stations. Want to know more about how water is produced? Many water companies have visitor centres. Contact your water company to find out more.